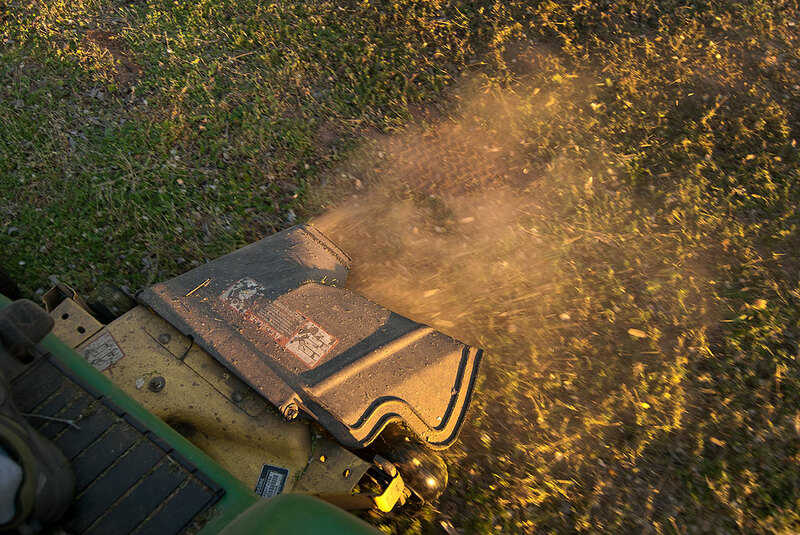 This is the ejection shroud of my John Deere mower as I mow a mopher mound – so-called because I’m a little unclear on whether they are built by gophers or moles. The scene is a barn more than 2000 years ago. A newborn baby sits in a manger, wrapped in swaddling clothes. Next to him is his glowing mother, Mary. His nervous father, Joseph, paces nervously back and forth. As he paces, his accidentally steps on the tines of a rake, which flips up and smacks him in the face. Yes, yard work team, I mowed a rake. Something quite similar happened to me last night. As I mowed the tall, scraggly spring weeds and grass last night for the first time this season atop our John Deer lawn tractor, I heard an ugly grinding/struggling sound from the deck below me, followed by the whole machine grinding to a halt. I shut off the blade and the engine started right up, but attempting to reengage the blades resulted in the same halting grind. As I drove to the garage I saw a piece of metal dragging the ground. I lifted the deck and raised the ejection chute to find the mangled remains of a rake I left near the garden when I was burning the brush pile last month. When I left it there, I could clearly see it, but the grass and weeds had grown high enough to hide it completely. I pulled out the twisted lawn implement and photographed it, then started the mower and felt very relieved when the blades roared to life, undamaged. I finished mowing. It was a beautiful night, and I made a few pictures at dusk. 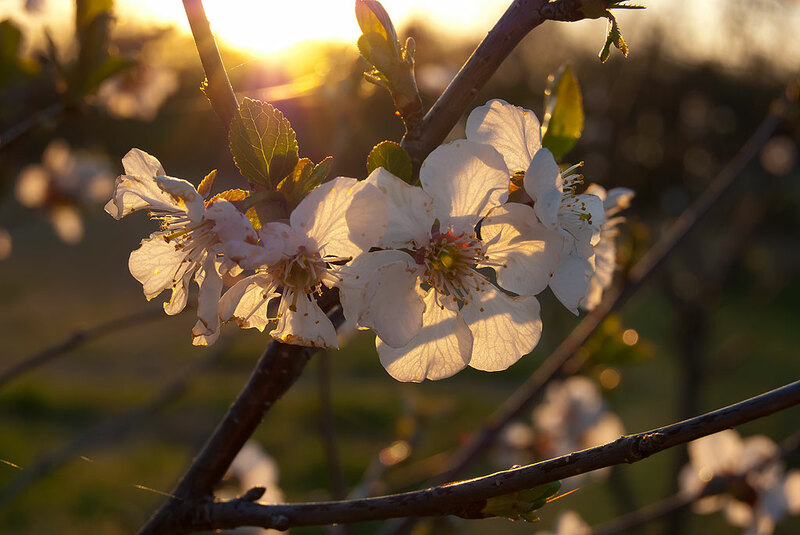 My cherry trees are in full-bloom right now, as in this image made just at dusk. Was Joseph the baby’s real father? 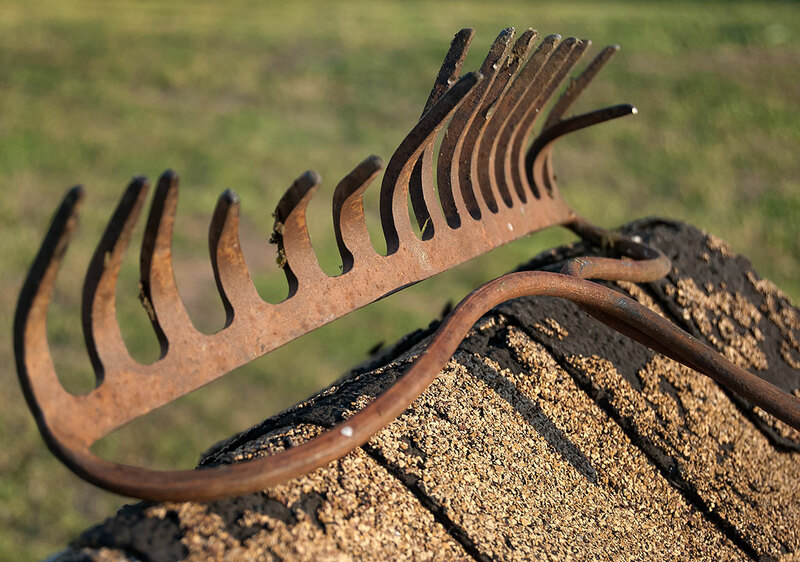 Those must be some *tough* mower blades to still be just fine after tearing up that rake… Kudos to John Deere! My lawnmower was assembled by children in Asia, and was very low cost. I assume it would shatter if I ran over so much as a pebble. The salvation of the blades is that they are driven by a long rubber belt connecting them to the engine.